In my more than thirty five years in the prison service, I have noted quite extensively how the prison community expresses itself. I have met quite a number of characters too. It is also a period I would consider as a generation of a specific population. Let me therefore share what my understanding is about the state of imprisonment, the dynamics of incarceration and the psychology of inmates. 1. The prison community is an inverted and a marginal society. It is inverted from the point of view of the free community. This can be gleaned from the way a person reacts on a specific stimulation, say when a loved one is recalled. To a freeman, he smiles at the thought. For an inmate, he becomes depressive. Prison is marginal because its culture is specific for those serving time. They have their norms, codes and secrets which are known but remains hidden and to be deciphered when brought out into the open. Prison officers live through for 8 hours (the period of their active duty detail) in this marginal community; and, prisoners live throughout this period for an average of 10 years. 2. The prison officer and prisoner must find common cause for their existence in the community and they must act out their respective roles. The prison officer must exude authority and express power through their built in supervisory function; prisoners, on the other hand, must be unquestioning, even mindless, if only to strike a balance of order. When the equation is reversed, prison administration is in a tailspin. Each one of them must overwhelm the other. It is a daily grind for the prison officer and the prisoner. 3. Although the prisoner is at the end of the food chain so to speak, they must express a certain degree of power if only to manifest life. Prisoners would form groups which would later be known as gangs. They would select the best person to lead and articulate their requirements. 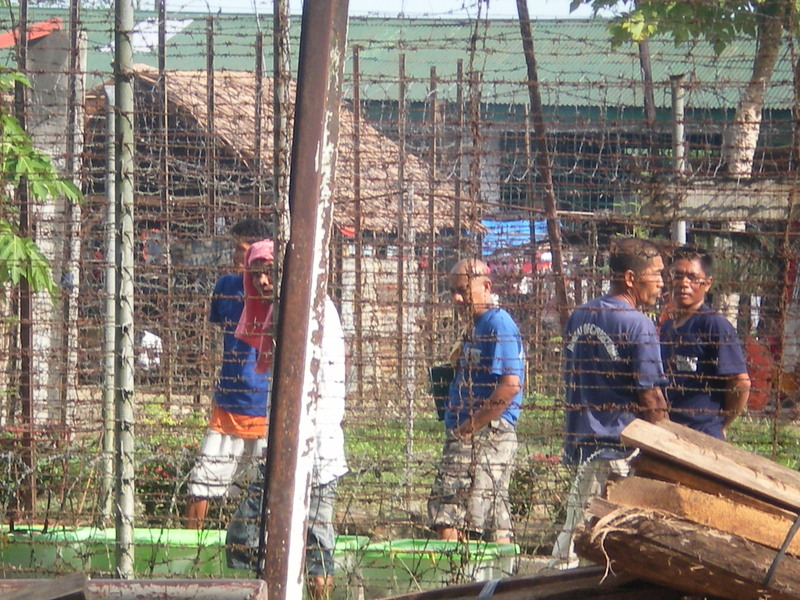 Although individually, the prisoner is powerless and defenceless in the face of secured fences and armed perimeter personnel, he finds relief and consolation by associating with his peers. It is here where gangs are most effective. 4. The prison officer on the other hand has the necessary supervisory control depending on the strength of his superior. While he has the advantage of belonging to an organized shift, he has vulnerabilities which the prison community can immediately ascertain. He finds a ready sympathy from those he is governing and it is here where familiarity and camaraderie are formed. To a certain extent, the relationship is even fostered by commiseration and understanding, which a prisoner has in surfeit as a result of their station in life inside. There were even instances when prison personnel have joined gangs as a consequence. 5. Relationship in the prison community is highly temporal. Affiliation is also very temporary if not provisional. There is no depth in any association only fleeting alliances. Everybody is guarding themselves. The environment is suspect and everybody is immersed in deception. If at all there is attachment forged it is more on survival and nothing more. To leave the area is wish fulfilment. Here is where prison officer and prisoner deviate. For the prison officer, prison is a life career. For the prisoner, a passing of time where any sense of permanence is immediately discarded. While inside the prison camp, to each his own is the general feeling. Death is everywhere and life is only found outside. 6. There are a lot of expressions for treachery in the penal setting. The closer a prisoner to his mate the more danger he gets. Those contracted to harm or kill are likely the one closest to the subject. Friendship is never an assurance for safety, it is even more applied for purposes of attacking someone. Like what has been earlier said that prison community is an inverted free community. The enemies one find outside is considered a friend inside and vice versa. 7. There is no concept of love in prison. Everywhere one finds gross familiarity and sickening hatred. Interaction among fellow inmates is coarse and vulgar but these are light and oftentimes dismissed as ordinary and imperceptible. This however does not reveal sensitivity. Prisoner, individually or collectively is susceptible and delicate. Errors are treated harshly and cruelly, and the wrong doer accepts any penalty with an open heart. False judgment however is never taken lightly. When punished without cause, a prisoner is unforgiving and ruthless. There are no gray areas in these matters. 8. There is no escaping mental derangement if one gets into the penal system, whether as officer or inmate. One internalizes the abnormalities of the situation. One is forced to admit its normalcy despite glaring discrepancy. One must admit as regular what is obviously a very irregular situation. Sanity is tested through insane means. One must force himself to smile and be subservient in a situation which must yield revulsion and contempt. When the prison community is silent, violence is not far behind. 9. The prison community is inhospitable and bleak even if one improves and transforms it into a five star hotel. The regimen and uniformity of schedule makes the ambiance severe and callous. For the officer and inmate, the stark similitude of surroundings reminds of punishment, of consequence, of humiliation, of shame. There is neither prestige nor esteem in presiding over the hardship of humanity than one obtaining in a penal facility. For the officer, the immersion is an education on suffering; for the prisoner, a lesson in humility. 10. Imprisonment hardens resolve. It heightens one’s tenacity. While it can be said that most inmates committed an offense as a characteristic decision done on the spot, the same instinctive determination is carried over in the prison camp. The manifestation however slows down because it is met with an equally firm steadfastness by the rest of the prisoners. 11. Viewed from another angle, imprisonment deadens one’s capacity for understanding. This is a consequence of concentrated attention on one’s safety. Every inmate knows that life is brittle, life is easily snuffed out, and almost every is impermanent. Every inmate has directly and indirectly subscribed to this notion because resignation for them means surrender and demise. Inmates must ignore any fleeting memory, and endure even faith for that matter, so that any unfortunate incident which may come unto them would only mean transitory. Inmates must believe and to a certain extent deceive themselves that everything is passing through and every problem, even if there are no solutions, is short-lived and momentary. 12. Imprisonment therefore must be a calibrated experience, not to be stretch any longer, neither it is to be shorted, for it is one crass experience which humanity at times has to undergo if only to yield the essence of genius and express the substance of greatness. Imprisonment is a break or make affair. For those who would make it is made, for those who fall short perish. Posted on March 6, 2012, in Uncategorized. Bookmark the permalink. Leave a comment.